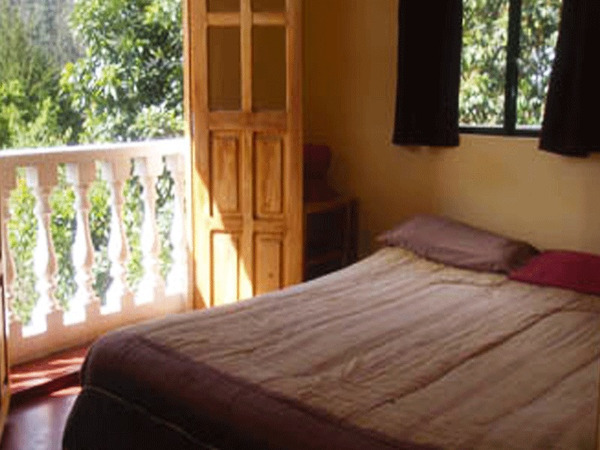 Our trek follows the slopes of the “Giants” of the Cordillera that are Illampu (el. 6370 m.a.s.l.) and Ancohuma (el. 6430 m.a.s.l.). Leaving from Sorata, we first reach the intermediate camp for the ascent of Illampu. 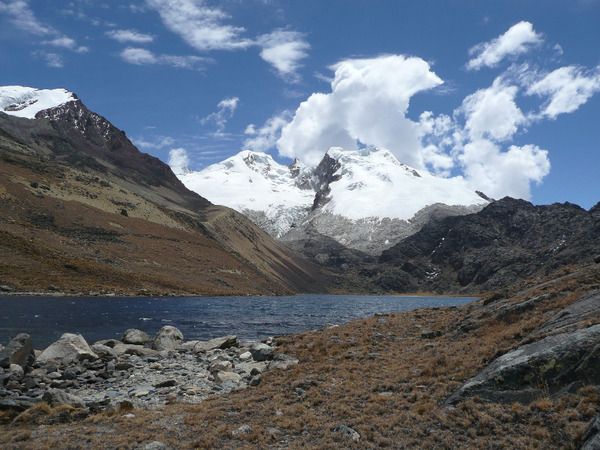 We climb to the Laguna Glaciar, intermediate camp for the ascent of Ancohuma, at an altitude of 5038 meters above sea level, before descending back to Sorata. 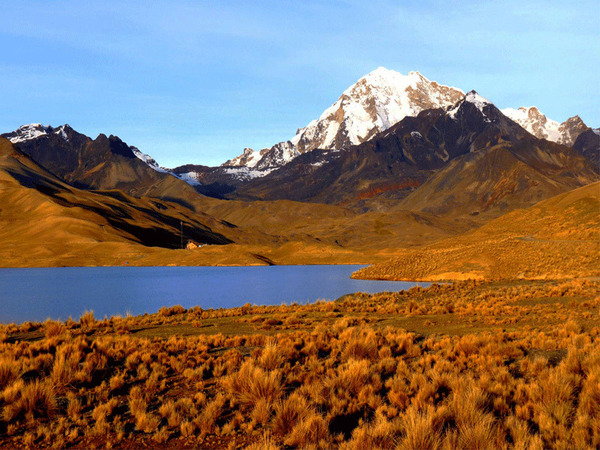 This well-preserved and still seldom visited mountain range (few mountaineers come to visit its peaks) offers us this beautiful 6-day loop where viewpoints over the Apolobamba mountain range, Lake Titicaca, Illampu and the bluish valleys of the Yungas alternate. Departure from the hotel at 9 a.m. with a private vehicle for a trip to Sorata (approx. 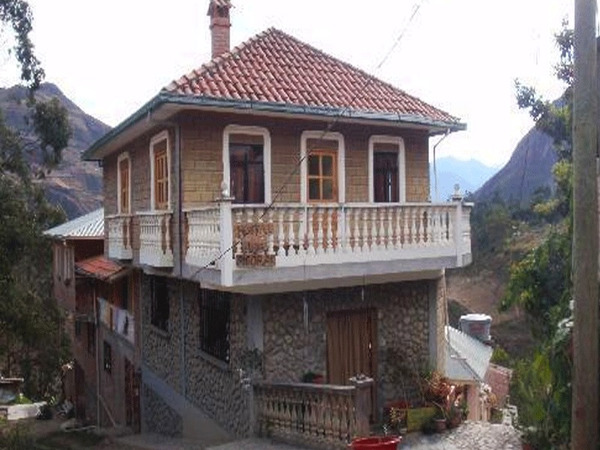 3h30), a quiet village in a green valley at the base of the majestic Illampu (el. 6368 m.a.s.l.). With good weather we can perfectly see the snowy summits over the palm trees of the village square, at an altitude of 2700 meters. Difficulty: trek at high elevation. 5 to 7-hour walking each day. Good fitness required. 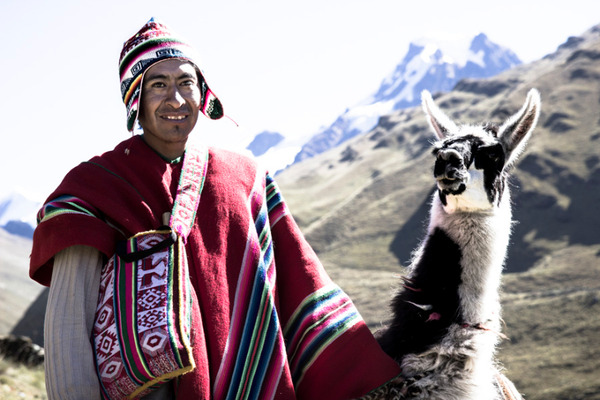 We will meet our team of muleteers just outside the village. 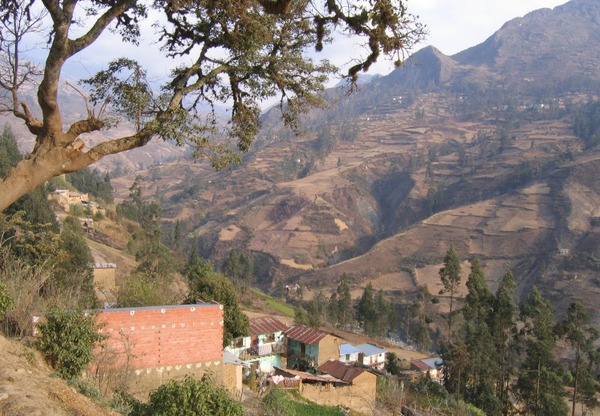 The trek will start with a long way up to the village of Lacatiya (el. 3900 m.a.s.l. ), our first bivouac. 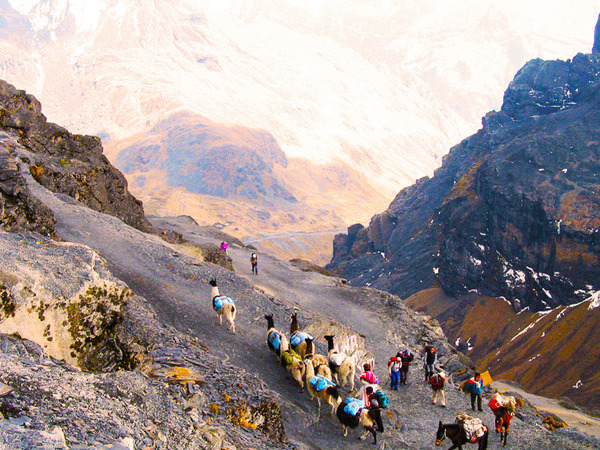 The Illampu will dominate us for all the day from its 6430 meters height. Cold lunch. All included. Bivouac in the community. 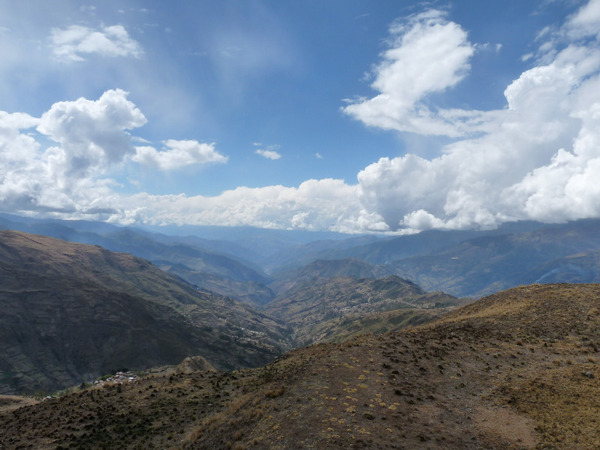 We will start the day with the climb to the Paso Illampu (el. 4750 m.a.s.l. 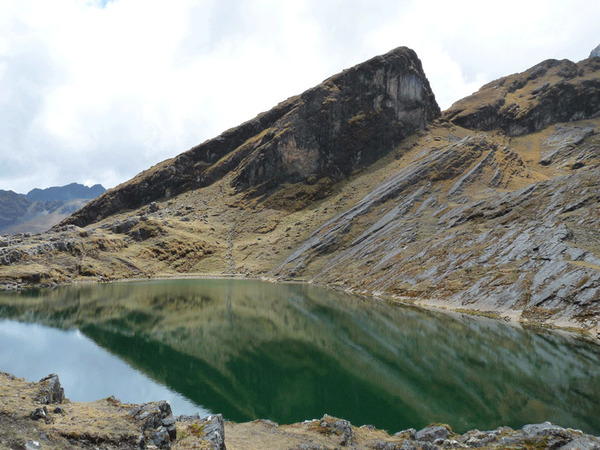 ), from where we can admire the giants of the Northern Peak of the Illampu (el. 6370 m.a.s.l.) and the Pico Schulze (el. 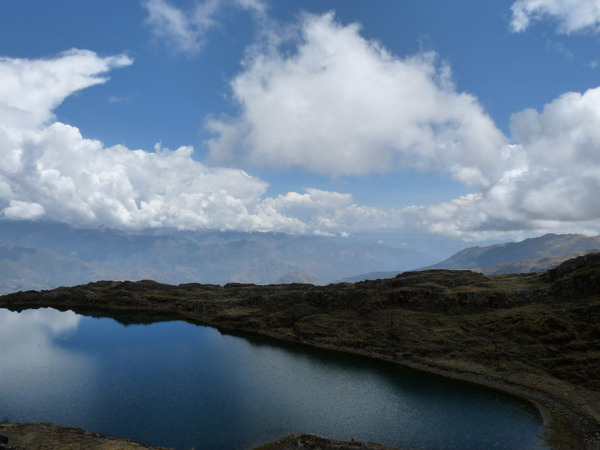 5950 m.a.s.l.). 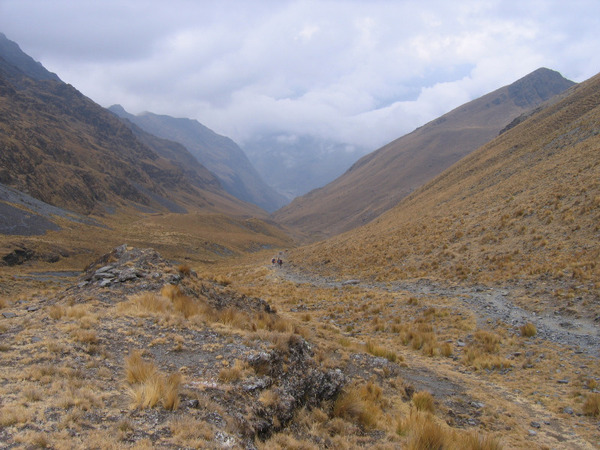 We will then descend on the Northern slopes of the Cordillera, to the Estancia Utjaña Pampa. Some old fashion gold mines which are still exploited can be found in this area. In the morning we will walk to Janq´u Uma (White Waters). We can notice there all kinds of man-made water holes on the banks of the River used to make the “Kaya”. This typical food of the cordillera is made from an oca (root similar to a potato) soaked in these pools for 30 to 40 days, before being spread on hays and left in the cold of the winter to dehydrate. 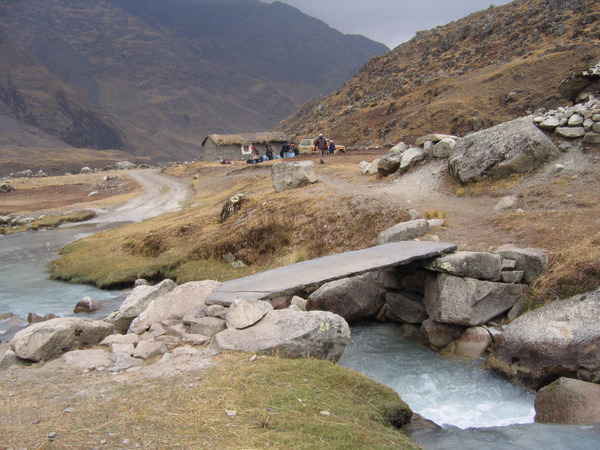 While the mules will slowly head to the camp for the evening, we will follow a track to the Laguna Glaciar. 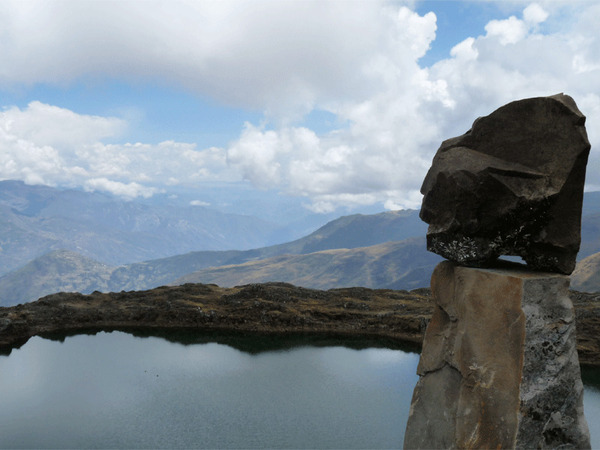 This altitude lake is hidden between two giants: the Illampu and the Ancohuma and is alimented by the impressive glacier dropping into it. 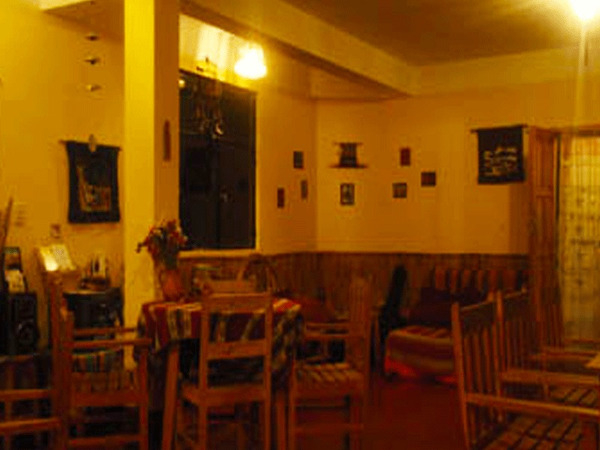 We will enjoy there wonderful views over the Lake Titicaca and the Sorata Valley. 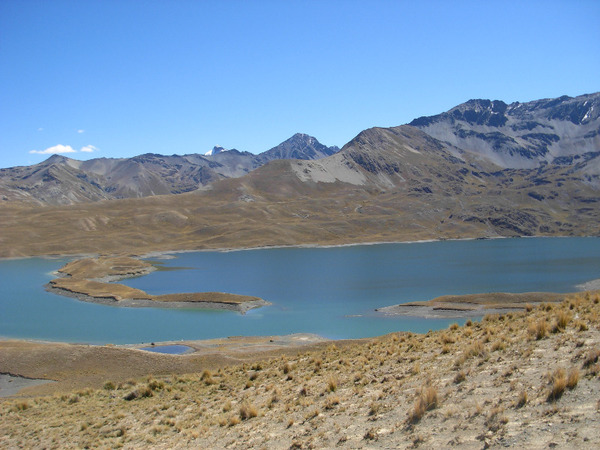 We will then walk down to the Laguna Chilata, where we will join the mules for a maté of coca!